Folkestone’s colourful entrepreneur the late Jimmy Godden had a conviction in 1984 for trying to bribe a councillor. Southwark Crown Court heard that he had handed a brief case with three thousands of pounds of cash onto a table in front of the councillor as a down payment for a £12,000 bribe to get the go-ahead for a major development, but the councillor had tipped off police and he wore a wire to the meeting. "JG" was given a six months sentence, suspended for two years. 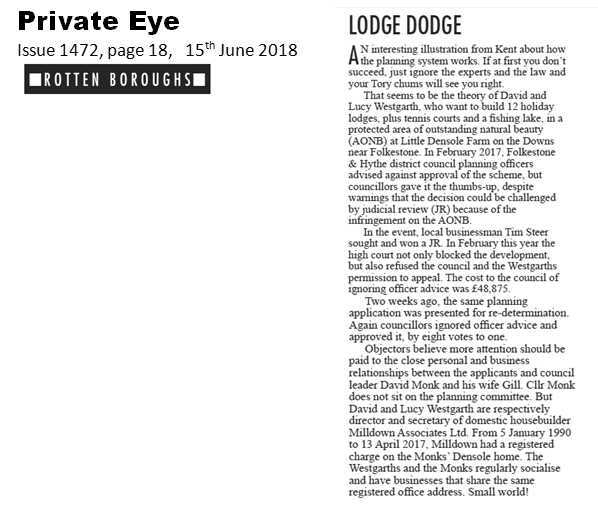 It was not a Shepway councillor who had blown the whistle, but it was Kenneth Piper a councillor from Margate who had refused to take JG's bribe. Jimmy Godden sold Folkestone’s Rotunda amusement park 20 acre land to Roger De Haan in 2006. In the spring of 2018 the District Council dropped "Shepway" and changed the name of the council to"Folkestone & Hythe District Council" seemly to try to avoid the Shepway shame! To see the money deal to destroy Folkestone's ferry port made with Boulogne? The economy of Shepway is based around the Harbour town of Folkestone with its ferry service, so when 'The Great and Good' allowed the owner of the harbour to kill off all the ferry services by massively increasing berthing fees and using other tactics to make certain that the ferry company could no longer operate ferry services the council should have taken 'effective' steps but they did not. Even the Member of Parliament for Folkestone & Hythe seemed to have turned a blind eye to the port owner's tactics in destroying the hope and future of our harbour town. As result all the ferries being stopped from running, - the harbour died, - the Folkestone town died, - and so Shepway's economy died. Our Anciient harbour town's heritage and future has been destroyed. 'Shepway', no longer stands for "The Way of Ships". Once again! 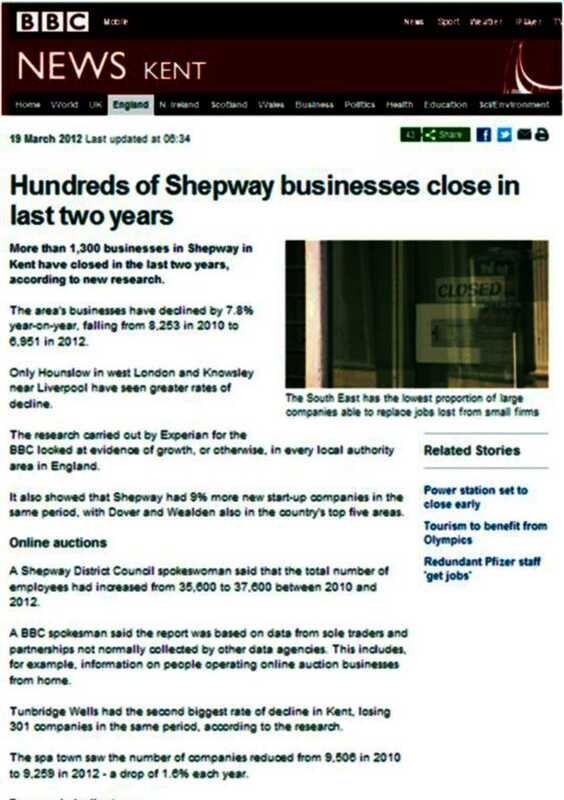 The way of Shepway, seems more akin to a corrupt dictatorship, than a democratic structure. 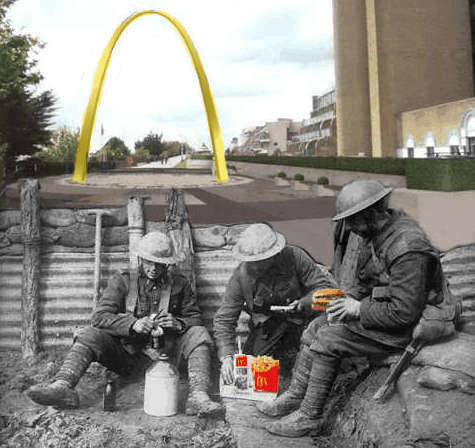 The view of three-quarters of public in a recent public vote were against public money being used on an inappropriate McDonalds arch to be put on the Leas in Folkestone in August 2014. Despite public outrage against it, and the seemly abnormal granting of the proposed planning application, it appears that the arch will be going ahead at the taxpayer’s expense, regardless. AS BRITAIN remembered the fallen of two world wars and other conflicts last weekend, a row was growing over plans for a grandiose new World War I memorial described by one forces veteran as an “obscene” waste of public money. The Step Short Memorial Arch at Folkestone, Kent, is to be unveiled in time for the 100th anniversary next year. Straddling the route to the port via which tens of thousands of men marched to ships embarking for France between 1914 and 1918, it will consist of two curved steel columns, between which ghostly hologram images of WW troops will tramp at night. (“Step Short” was the order given to troops so they could keep information as they marched down hill.) Who would object to a new memorial to the dead? Plenty in Folkestone do. They say it is unnecessary – Folkestone already has three memorials within 100 yards of the proposed new one, including a splendid bronze statue of a mourning “motherhood figure” looking out to France, which was erected by public subscription in 1922. At the base is a panel showing in silhouette a moving mass of men – representing those who passed the spot during the war. Critics say the new design looks naff – strongly reminiscent both of McDonald’s golden arches and the “victory arch” the late Saddam Hussein erected to his glory in Baghdad. And they say it is an inappropriate use of public money at a time of austerity. Some £150,000 of the £400,000-plus total cost will come from Kent county council and £200,000 from Shepway district council, the Step Short charity having failed to raise enough from the private sector. As the total number of British and Empire troops to have fought in World War I was 8.7m, of whom 5.4m fought in France and Flanders – by no means all of whom embarked from Folkestone – Collins is way off target. But why let facts intrude into history? The above is an extract from Private Eye, Issue 1353, 15 November 2013, page 14 - Rotten Boroughs. In August 1914 soldiers were boarding troopships at Southampton bound to Western Front, - not Folkestone! On 4th August 2014, His Royal Highness Prince Henry of Wales, (Prince Harry) is expected to come to Folkestone to unveil the arch. It was not until the following year, that the troopships started using the Port of Folkestone and continued to do so until the end of the war. During which time, regardless of the many German submarines, German costal guns, and sea-mines, not one of Folkestone troopships was sunk. An amazing achievement which the town of Folkestone should be proud of part the harbour town of Folkestone played in the Great War a hundred years ago, which should be suitably marked during the centenary, if the owner of the harbour land would allow the town remembering its impressive maritime past, and drop the daft McDonald's style arch. Step Short tales of millions of men marching down Folkestone’s Slope Road now known as the Road of Remembrance are just tall stories. The true historic departure point for France, should be remembered and marked. 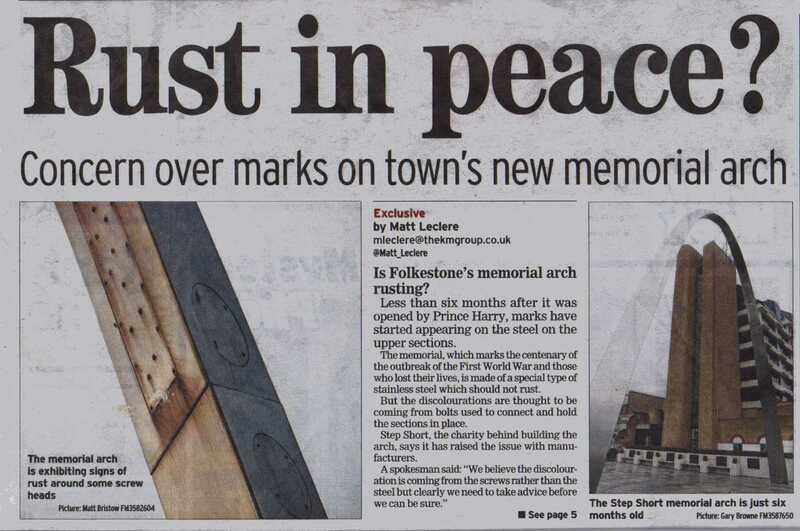 Instead of respecting our heritage the current owner of the Port of Folkestone, Sir Roger De Haan, has destroyed the wealth of maritime heritage of the ancient harbour town of Folkestone, and it's future. Just in time for the passing of the centenary of the First World War. 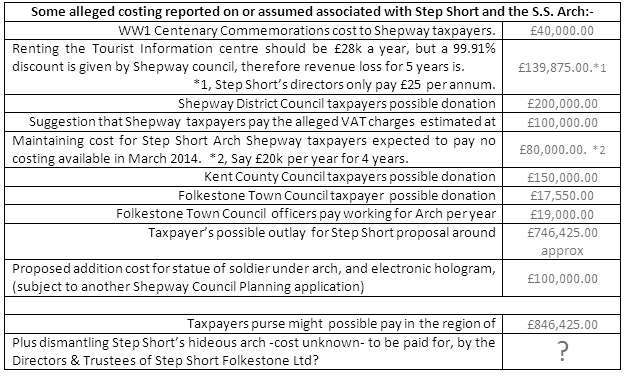 Below are some of the ridiculous and frightening costs that have been rumoured around the Step Short proposed expenses claimed at by Step Short Folkestone Ltd, Damian Collins M.P., and fellow trustees and directors, including Cllr. Ann Berry, Mr E Rooney, Mr P Emden, Mr M. George, Mr G. Jordan, and Mr G. Tolson. Step Short Ltd., is an Ashford company, Registered Number: 07577216, and as of 31st March 2013 the firm’s balance sheet shows £57,080.00, yet their cost for the stainless steel McDonalds style arch in 2012 in the planning application was £120k. There are questions that need an answers. If Shepway District Council actually carried out and effective independent examination and audit into Step Short’s claim as being far and reasonable, and work put out to tender ?- If not why not? 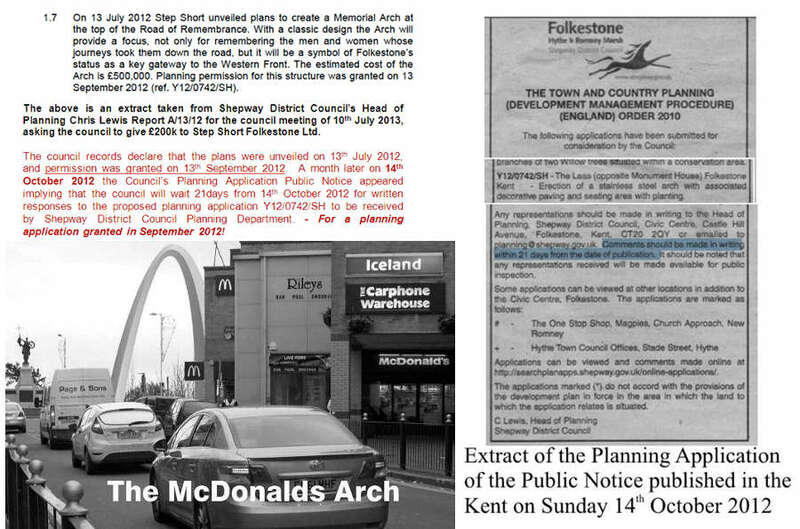 It should be that Step Short Folkestone Limited meet the total cost for their disliked arch, not the taxpayer. Seemly the company directors and trustees tried the National Lottery but were understandably turned down for funding. 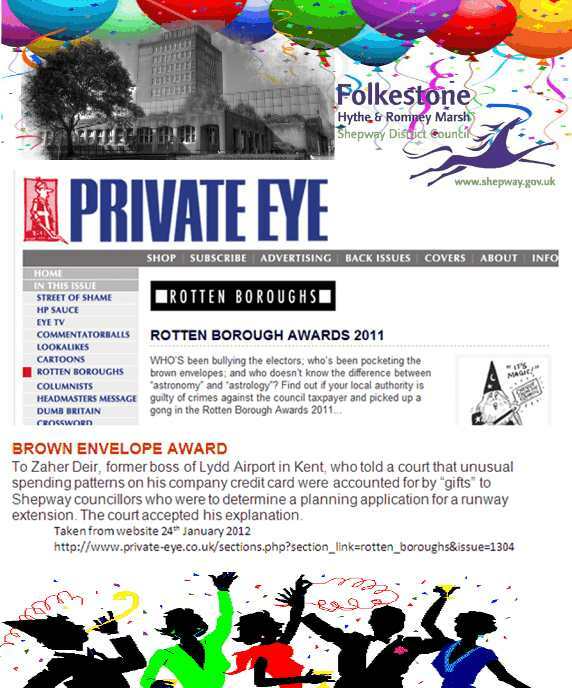 The above is another amazing achievement for Shepway District Council, wrongly using the taxpayer’s purse to pay for, the wrong thing, in the wrong place, at the wrong time, at the wrong price! Also the wrong material, as the arch within the first six months is rusting away! Just cover up the rust with a coat of yellow paint?